oh natalie! you are saying. natalie! how did you make that doily wall? i can hear you from here, i know! the paper goes on first, wall paper style. i found it best to tape the paper on so that the roll was facing inward, if this makes sense, so the sides curled toward the wall (i needed less tape that way). then i hung the lights using push pins. i only used six, three on the top in the joint between the wall and the ceiling, and three along the bottom so the lights didn't brush the floor (husband very hole-in-wall averse). 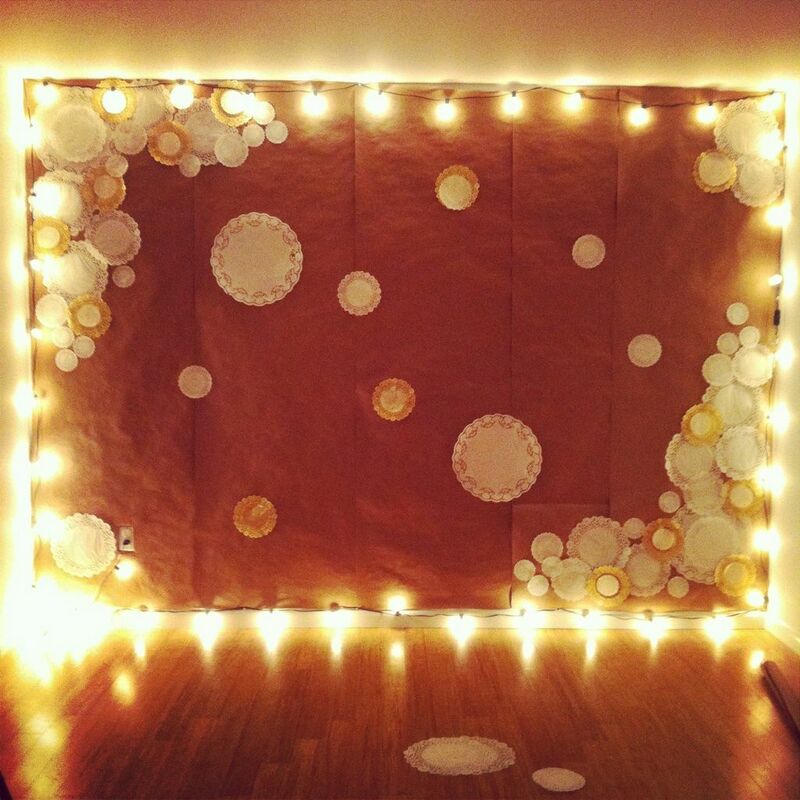 once you have the backdrop up, you can tape doilies around to your heart's content. i fussed with the placement of mine for a bit, luckily the brown paper is super forgiving, and tape isn't exactly permanent. i found it easiest to start with the big dudes and work in zig zag shapes. and take lots of breaks to step back, take a sip of diet coke, make sure things are balanced, and go "hmmmmm." and then do your best not to stage all day renditions of the nutcracker in there. i've been the sugar plum fairy at least three times today. can't help it. That's really cool and I wish I had a wall in my apartment that would work on... but alas, Moscow Idaho apartments are tiny and you know, the U of I doesn't take too kindly to holes all over the walls. But if they did, I'd be all over that. Awesome. That whole experience just sounds awesome. I want one of these in my house. It is amazing! is there anything better than fussing over something? i don't think so. I just saw you comment on the duggars on the today show... Trademark stripes and Henry on the hip! I feel like I live in a small town haha. Yes! I was hoping you'd do a tutorial. i need this is in my apartment because my disney song concerts seem to fall flat when i use the tv as a backdrop while sports games i don't want to watch are on. i just need to find the room now. Saw you on Today too! Turned around and yelled at the dog and said "Hey! I know that girl!" and then proceeded to explain to the dog how I don't actually know you but how it feels like we're friends anyway... he seemed bored with the conversation but it was funny all the same! Amazing. Every girl needs a stage on which to perform in her living room. Were you just on the Today Show?! pretty--and i saw you on the today show coooL! Are you going to leave it permanently??? Can you share how to do the photo wall? I'm dying to do it when we finally find a house we actually want to buy. This is seriously so cool-- LOVE IT! 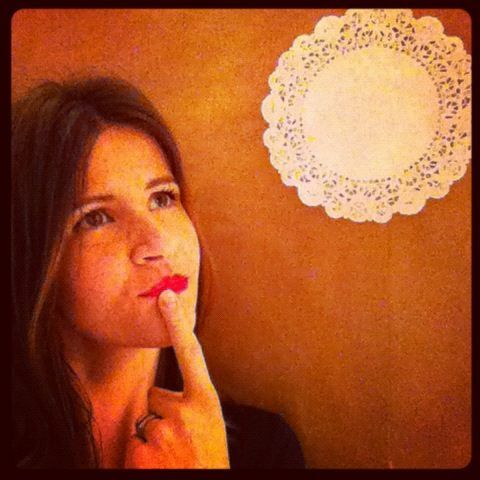 PS - That pic of you pondering the doily is priceless. Turn it into a poster or print!